The United States sent military advisers to Somalia in October to aim their fight against the radical Islamic terrorist group al-Shabab. It is the first time the U.S. military has been in the country since the “Black Hawk Down” incident in 1993, which downed two helicopters and killed 18 Americans. The terror group is based in the country and is connected to al-Qaeda. It was responsible for the attack on Westgate mall in Nairobi, Kenya in September. The hostage situation lasted over four days and killed over 60 people. Al-Shabab is also the group connected to Britain’s “White Widow” Samantha Luthwaite, whose husband was the 7/7 bomber. After the Westgate massacre, Interpol designated her as their most wanted woman. Somalia’s government collapsed in 1991, and the State Department has not opened an embassy in Mogadishu since then. The CIA has been there for years on a small base and helps finance a few security forces. Since 2007, the U.S. government has spent more than $500 million to train and equip an African Union force of more than 18,000 soldiers that has sought to bring order to Somalia and strengthen the weak Somali national government. Most of the soldiers come from Uganda and Burundi and receive training in camps outside Somalia from U.S. contractors and uniformed military advisers. The United States has also spent more than $170 million to build up the nascent Somali national army, although that force is relatively weak and unreliable. African Union (AU) forces control most of Mogadishu, and troops from other countries help too. 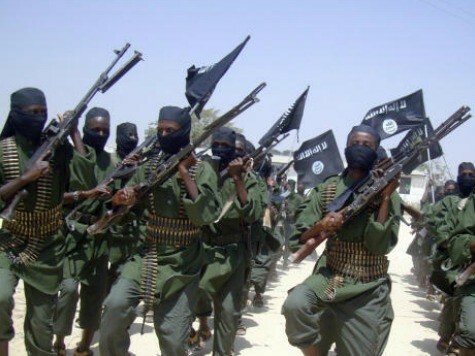 Al-Shabab targeted the Westgate Mall in Kenya because the AU sent in many troops to help fight the terrorist group. Piracy is another crime associated with Somalia. Traveling in the Arabian Sea along the African coast is often discouraged because of the pirates who patrol the waters. In November, a U.S. court sentenced two pirates to life for killing four Americans aboard their yacht in February 2011. Nineteen Somalis were involved and 14 have been sentenced. Al-Shabab imposes strict Sharia law in the areas they control, which includes dress codes and bans on entertainment. The group set a 15-day deadline to stop services to companies that would have provided cell phone Internet connectivity in the country. If they do not comply with the demand, the companies will be viewed as an enemy and punished according to Islamic law. The United States would like to bring diplomats to Somalia and have a presence in the country.